Stop Trying to Relieve Pain, Listen to Your Body’s Defenses! Home / Blog / Stop Trying to Relieve Pain, Listen to Your Body’s Defenses! What if that pain in your back was all in your head? Now, to be fair that title is merely an attention grabber. However, there is some fascinating research on the benefits of cognitive and behavioral therapies. These studies look at rewiring brain signaling to focus on other things instead of pain. But here's the hard truth: you will never be pain-free! Well, unless you have a super-rare-freaky medical disorder known as congenital insensitivity to pain, you will always experience and want to feel pain, so that you can react to it! In short, pain is a signal that something is not right and that it requires attention. You can think of it as your personal smoke alarm. Okay, but what if you've had pain for years? Chronic pain (lasting more than 12 weeks) affects about 100 million Americans and nearly 1.5 BILLION people worldwide. That's more than diabetes, heart disease and cancer combined. This is a big problem! If you're feeling pain for more than 12 weeks, you want to find a way to relieve that pain. You've been feeling terrible for weeks on end. As if that wasn't bad enough, relieving the pain doesn't even have a good outcome. The options are usually limited to treating their symptoms, not identifying the root cause. This solution often makes those suffering feel even worse through addiction, and dangerous drug-related effects. 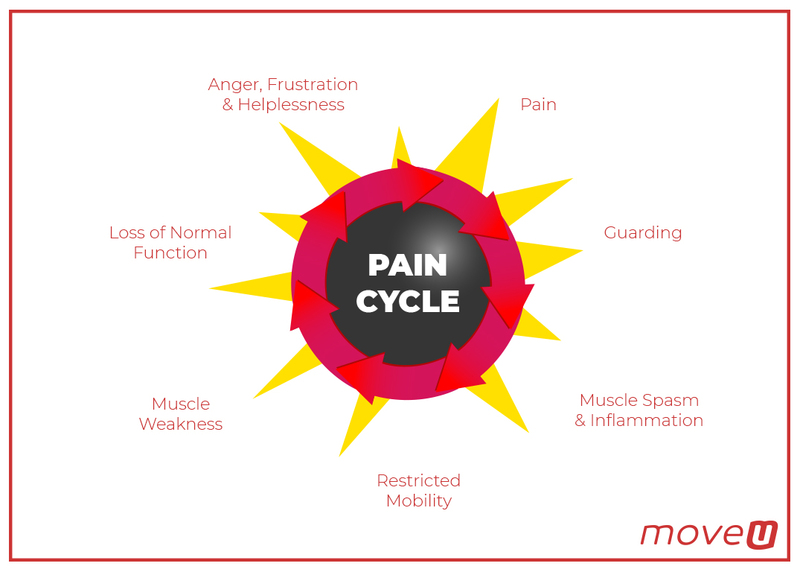 Recurring or chronic pain can be a vicious cycle. You get injured, and to sidestep the pain, your movement, posture, and sleep is affected. The discomfort diminishes over time, but the movement patterns stay with you until you hurt it again. Do this enough, and isolated injuries can turn into chronic pain. How can our thoughts affect pain? Cognitive behavioral therapy or CBT is an evidence-based model being used to treat a negative pain mindset through behavioral skills and psychological treatment. Brain-imaging studies show that after 11 weeks of group CBT patients report less pain, greater control over their experiences, less catastrophic thinking about pain, and, importantly, increased volume in the regions of the brain associated with pain control. So now that we have a better understanding of what pain is and have established that putting positive energy towards it can have therapeutic effects let us start thinking about pain entirely differently. Your body is telling you something: LISTEN. Remember the analogy we used earlier? Pain is our body's smoke alarm, some of us freak out and call the fire department, while most of us wait and hope it will turn off on its own. You don't want to overreact, but you don't want to ignore it either. The goal is somewhere in the middle. Don't rush to the pharmacy counter every time you tweak something; there is a lesson to be learned here. How did I move to cause this pain? Did I do something different to create this? Do I know how to not to do it again? Use the internet to narrow down the possible source of the pain; see if there are movements or stretches you can do to help alleviate it. Your body is like a mechanic working on your engine; he's an engine expert, so you need to become the body expert. You are doing something wrong: Figure it out and change it! Be proactive towards pain, not a victim! This act in and of itself is empowering. By learning and acquiring knowledge about the injury or pain, you're experiencing will help you to form a better understanding of your body and the reason it is sending you this signal! Body awareness, more commonly referred to as the mind-body connection, is learning the proper positioning of your body and being able to maintain those positions throughout everyday life. It's not your fault if this is all news to you; nobody teaches us this. Physical Education, if you were even lucky enough to have it, usually focuses on individual or team building skills, not posture and form. We are just scratching the surface on the power of the mind over our bodies. We all know that optimism and finding the silver linings are always a good tactic for navigating life's hardships. Adding a little bit of that towards your pain can be quite powerful. If you are genuinely feeling proactive, need answers to your questions and want to learn how to master your body, the MoveU program helps you relearn that mind/body connection. The program guides you to discover where the imbalances and pain are coming from. Plus, if you’re in pain right this moment, you can relieve it with our quick exercises in the symptom relief library, included in the program! Whether you're dealing with an acute injury or one that has become chronic let us help MoveU out of pain. Learn more about the MoveU Program and how it can help you not only relieve pain, but help you deal with the source of your pain, become more aware of your body, and become stronger. If you have any questions, contact us at info@moveu.com!